Palak paneer is one of the favorite Indian recipes. It is tasty, healthy and moreover very easy to make. This particular preparation can be completed in less than 20 mins. But there is a word of caution, this time does not include the time to clean the Palak. 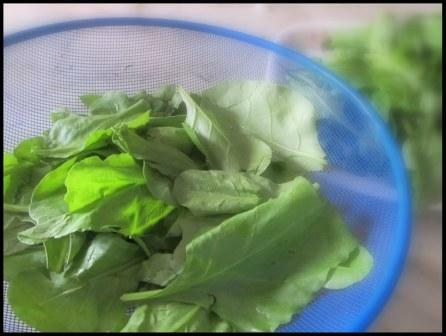 It takes me a long time to pick and choose leaves of palak among the bundles I buy from the vegetable vendor. If I buy three bundles, after processing only one bundle worth of leaves stay. But it is up to you, may be you are not as picky as I am. So First Step, clean the Palak very carefully, so all the dirt are washed away. 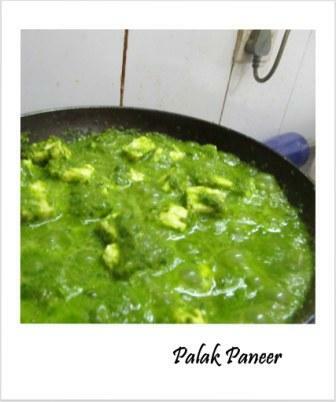 Then follow the next steps to get the easy, healthy and tasty Palak Paneer. 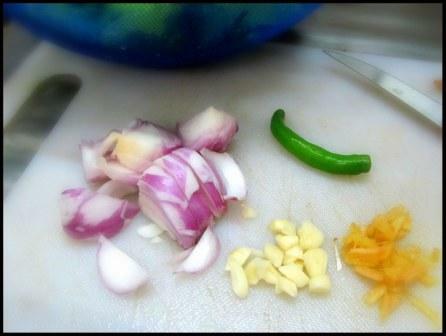 This preparation does not need a lot of ingredients, but you know the list of spices will be so long that the list becomes very lengthy. Paneer – One whole packet, This is the most fatty part of this recipe, but also the most tasty part. Let’s start making palak paneer. 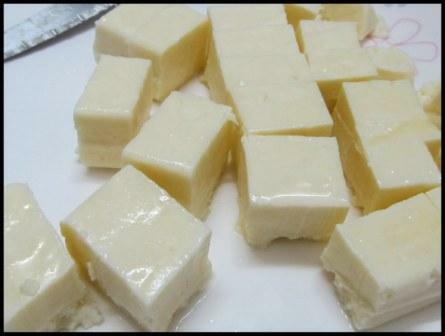 Take the Paneer and cut it into small cubes may be 1″ in length and width. 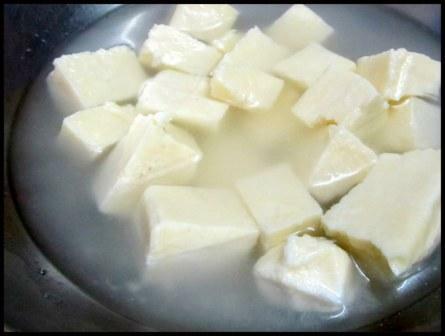 Take a bowl of water and mix 1 Tbs of salt and immerse the paneer cubes. Next, put three cups of water on stove, or whatever heat source you are using, for boiling. We are going to use this for blanching the palak. (Blanching is fancy word used to explain putting (mainly) vegetable in hot water for a brief period of time, and immediately putting them in ice or ice water to stop the cooking process. If you use this the green vegetable looks so green that it will literally amaze you). Now here we are only going to use quickly in the hot water part of the blanching. 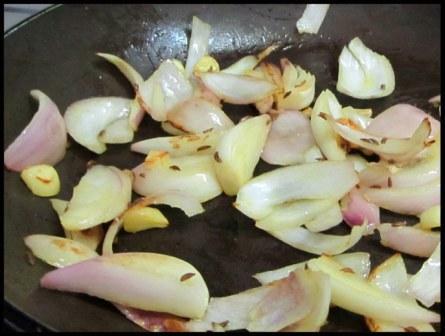 While the water is coming to boil, cut the onion in big chunks, remove the stem of the chili and remove the skin of the garlic and cut into small pieces. And if you are using ginger, then cut them into thin sticks. If the water is boiling by now, put the palak leaves in the water and take them out after 20 seconds. Keep them aside. 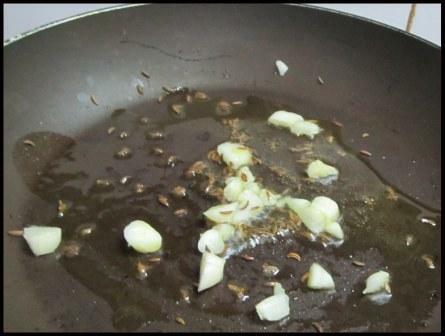 Take the frying pan and heat some oil in it, when you see there is no bubble in the oil, it is hot enough to start cooking, put the garlic cloves and you should hear some splatter, meaning hot oil. After sauteing (meaning frying quickly) the garlic put the onions in the pan and saute some more. While the onions are cooking, take a small bowl and add the curd and all the powdered spices mentioned in the spice section of this post and mix well with a spoon. Check if the onion has changed color and looking more transparent. 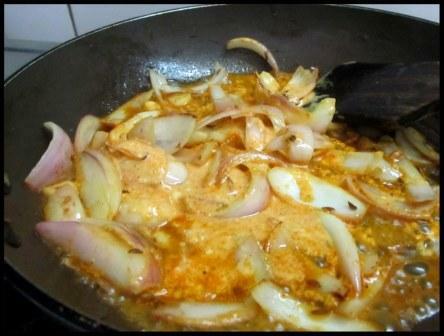 Now add the curd-spice mixture with the onions and stir for few seconds. Take it off the heat. 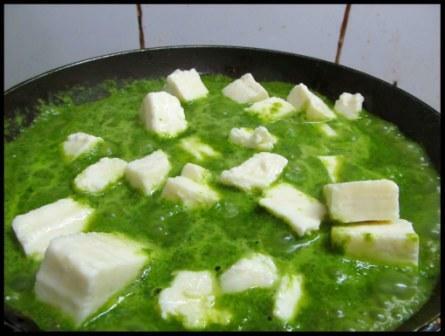 Now put the pan back on the stove and pour the green paste into it and add the paneer cubes and mix well. Cook for a min or so, and your Palak Paneer is ready to serve. A Note here, do not cook paneer for long, it becomes very hard. Cut the Paneer into cubes. Take some water in a bowl and add some salt in it. Keep the paneer cubes in the water. Put some water on stove for boiling. While water is boiling cut the onion, garlic, chili and ginger. When the water starts boiling add the palak leaves for 20 seconds or so. Take the leaves out of the hot water and keep aside. 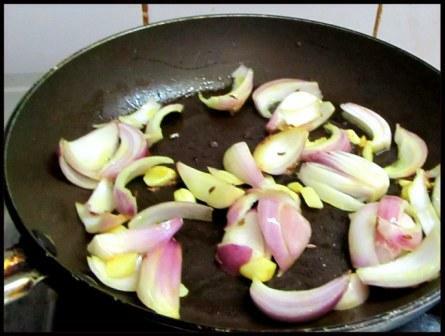 Put a frying-pan or kadai on stove and add oil. 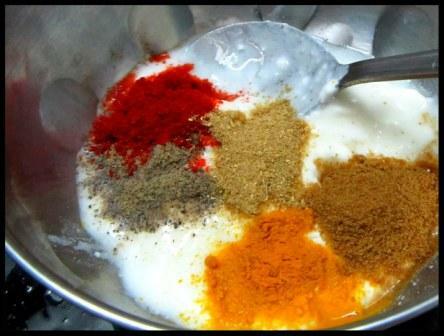 While the onion is cooking take a bowl and add curd and all the powdered spices, mix well. Add the curd-spice mixture with the onion and mix momentarily. Do not keep this for long on the stove. The curd has a tendency to curdle in heat. You can do this step off the heat as well. Anyways, event it curdles it will not harm our dish. 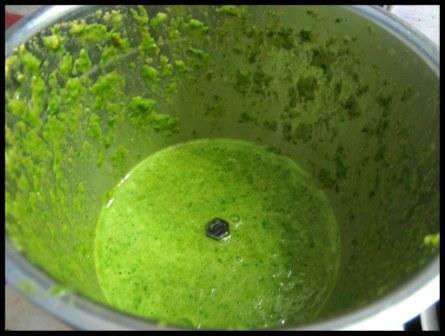 Blend till you get a green paste. It will not take long to get that either. Turn the heat on the pan and add the green paste. Your Palak Paneer is Ready. I know, it feels like too many steps, you will feel that first time. Try it once and you will feel it easy. Just remember, two main ingredients, palak and paneer. For paneer just put in salt-water. For palak, blanch it, mix with fried onion and spice curd mix and blend. Finally mix… and you are done. Hi! This is Sharmistha. Welcome to my food blog. The main intent of this site is to provide you with quick, tasty and somewhat healthy recipes. All the recipes posted here can be prepared under 30 mins! Let's experiment and cook some good food. 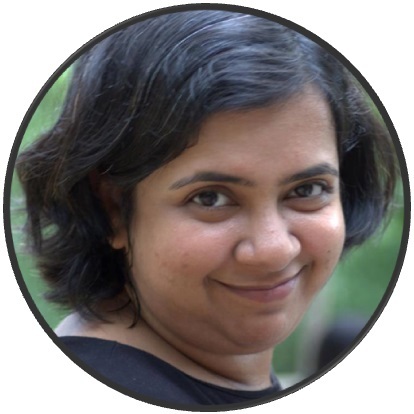 Copyright © 2019 Recipes By Sharmistha Dey. Powered by WordPress. Theme: Spacious by ThemeGrill.